Spring is here and the time has come to shed all those extra layers of clothing .Time to say goodbye to the sparkly make up and say Hello to beautiful ,glowey skin with minimal make up .Deep cleansing is essential to glowing ,pure skin and masks are a cool way to deep cleanse your skin.Also it is super easy , Just cleanse your face with facewash and apply the mask all over the face and neck and even upper back and then place two cucumber slices on your eyes and just lie down and relax meanwhile the mask does its work . So today I am going to review (you might already have guessed ) the SeaSoul Dead Sea Facial Mask.I received this in my January 2015 FabBag .I have already been using the SeaSoul CC cream and mightily impressed by it so I had high hopes with this mud mask too . Price - Rs 995/- for 50 ml and Rs 3195/- for 200 ml . You can buy it by clicking here .Though if you keep looking at the website they come up with discounts from time to time when you can stock up on favourites . 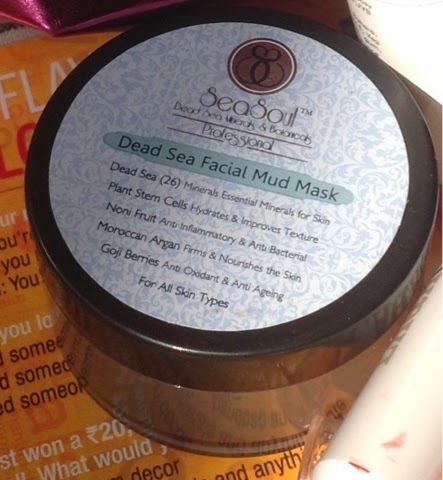 What SeaSoul claims - This particular brand specialises in dead sea minerals rich products . 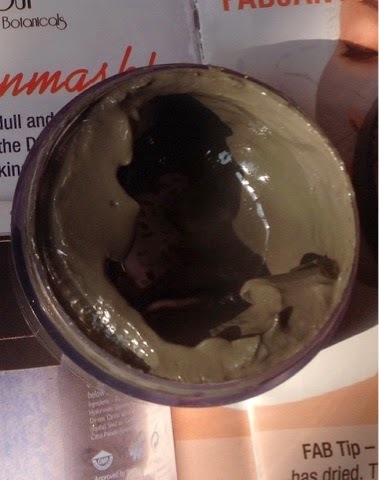 Moroccan Argan-Firms & nourishes the skingiving it a rejuvenated & nourished look with a natural glow. 1. Easy to apply , spreads easily . 2. 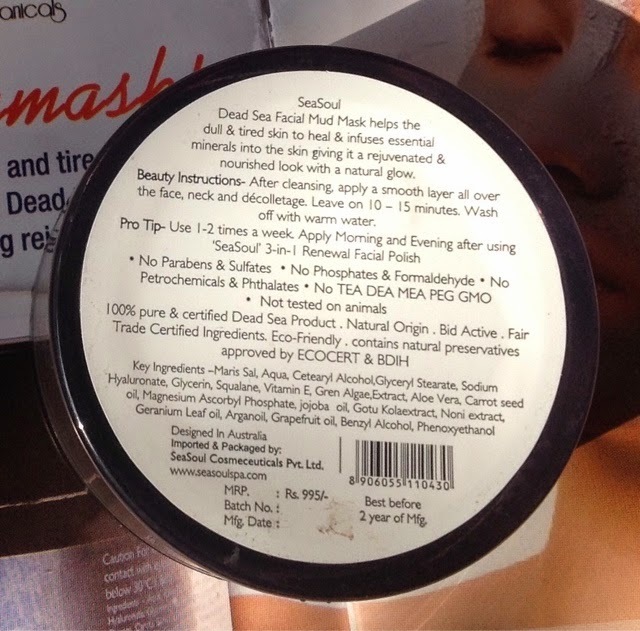 It actually makes the skin feel rejuvenated and purified.You can feel the difference after a singlu use ,But regular use definitely helps in making the skin look cleaner and blemish free .As I had shared the SeaSoul HD finish CC cream ,containing sea minerals also made my skin look much better with regular use .It is advised to use it twice a week . 3. 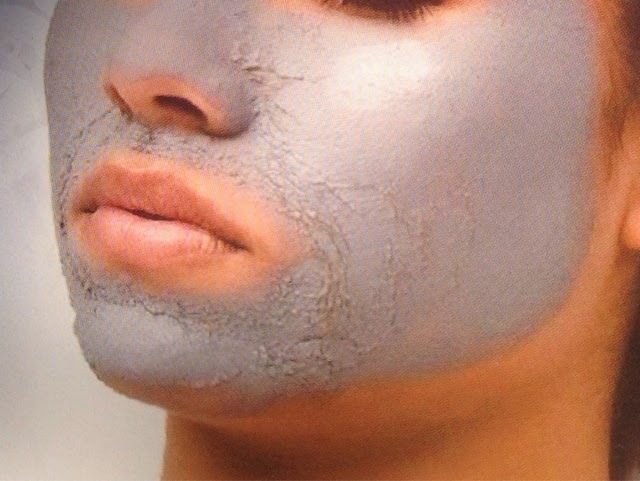 Easy to remove , you can just wash it off with warm water . 4. My skin did not feel dry after use . 1. I did not like the unhygienic tub packing .I would have preferred a tube packaging . 2. It has no fragrance .Though I do not mind that . 3.Expensive ,but worth every penny . Make sure your Hubby/ Kids/family members do not see you with this on.It looks scary ! 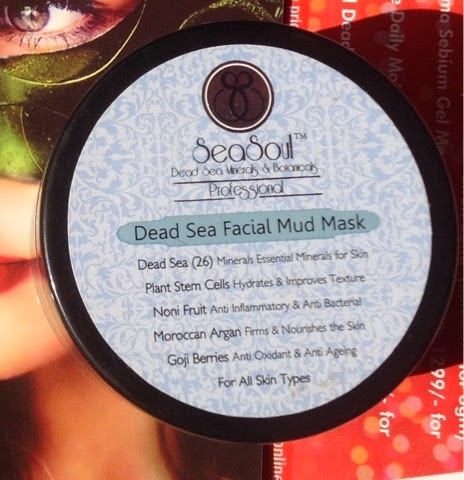 FINAL VERDICT - I rate it a 4.6/5 .SeaSoul Dead Sea Facial Mud Pack is a product worth its (sea)salt !!! Go for it if you want glowing ,pimple free skin without hesitation ,you won't regret it .